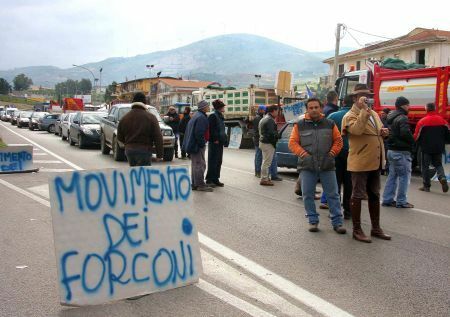 The 5 day-strike announced by the pitchfork movement is over; but the struggle against the crisis and the blackmail of debt has finally reached the souls of those living on Sicilian lands, and large parts of the movement have announced their will to carry on the protests. Today a big demonstration of more than 1000 students in Palermo is more evidence of the sympathy and complicity of the urban areas with the struggle and demands of those who have caused so much inconvenience with their blockades: from scarcity of oil and fresh food, to transport problems. And they did this despite the attempts to criminalise the movement by the media and many intellectuals and commentators – attempts that have grown as the protests have intensified. The points made by these tin-pot politicians are many, but they can all be summarised with 3 simplistic labels to stick on the protesters: mafiosi, fascists and manipulated. If you look carefully, these are all criticisms made by people who, 5 days into the campaign, have concluded they can’t twist it to their own agenda (e.g. Confindustria, Italy’s largest confederation of manufacturing and service industries, and the centre-oriented newspaper Repubblica‘s friends); or by political analysts who completely ignore any form of material reality, and expect struggles to be ready for use, neat and devoid of external interferences. The people’s protest in Sicily, just like any protest of this kind, is a complex and contradictory mass protest. Without a doubt, it uses familiar rallying cries: it’s against globalisation, against Equitalia (Italy’s state tax collectors), against the legalised practices of loan sharking that blackmails a large number of the Italian society, against the leftwing and rightwing political elites which are putting workers and their families on their knees, against the increase in oil prices and the cost of living. The pitchfork movement has identified the right enemies, and put into practice their analysis using solid tactics: blocking the traffic, blocking trucks coming in and out of cities, propaganda against the local and national authorities. To find clear answers to the criticisms against the movement and its supposed manipulation by reactionary political forces, all we did was to mingle with the protesters in Palermo. All we did was listen to the voices and the megaphones, read the words shouted on placards and leaflets. It is plausible that someone has (or, more likely had) their own agenda on the mobilisation, but the people on the streets showed a deep, complete distrust of any politician or tin-pot politician, rightwing or leftwing, from Movimento per le Autonomie to Forza del Sud*. And even if everything turned out to be the fruits of a plot by Miccichè**, it would seem that their spark has caused a fire that they cannot control any more – witnessed by all the unsuccessful meetings with Lombardo***. With regards to the fear of fascists being part of the movement, we can’t find words more appropriate than the joint communique released by Anomalia and Viklab: “We think it’s biological, within these movements, to look for support anywhere it can come from; aren’t the real guilty those who, by distancing themselves from the reality of social relationships, give space to all those who, obviously (and that’s no news), try to use that space to spread their dirty populism? Isn’t it the same old rhetoric of “champagne socialists”, always waiting for pre-packaged, ready to use, messianic moments? Aren’t they the same leftwing politicians who’re never ready to “get their hands dirty” dealing with the murky realities of movements whose future direction needs to be fought for, not kept at a distance”. As far as the accusation of Mafia infiltrations is concerned, we think there’s a parallel with another classic criminalisation of a group within a context of national mobilisations: the black bloc. South of Naples, it’s the Mafia that gets used as a way of crimilasing the whole movement: we find it impossible to forget the same accusations against those people in Campania who were fighting against an incinerator being built in their neighbourhood (but there are many other examples). It’s always the same method: find an evil monster (no difference between a Germanic-sounding monster, dressed in black and wearing a balaclava and a short Southerner wearing a Sicilian flat cap), take pictures of the monster among the protesters and spread the fear. Really, we don’t think it’s worth wasting our time discussing this. What is central to us is that what supposedly started as a corporate protest in a couple of industries, has become a general, popular protest. We were saying before that a situation of this kind can’t help being complex and contradictory – much to the disappointment of intellectualoids and radical-chic tin-pot politicians – but criminalising it from the start is a double mistake. Firstly, its criminalisation offers a chance to those with their own political agenda to resolve the contradictions their own way. Secondly, it covers up the real motives of such a huge mass of people getting on the streets to express their anger against an injust economic system and a political system deaf to the people’s needs. Without trying to be too simplistic or make easy parallels, we think we are in the presence of that same mass that, from Madrid to New York, filled the streets to demand a more dignified existence and a happier life, against a global economic-financial system and the political system that feeds it. We are in the presence of the same anger that, a few miles South from Sicily, has caused the fall of longstanding dictatorships. Nevertheless, the solidarity and sympathy that the same commentators expressed against those huge and heterogeneous movements seem to disappear here, due to the fear of having to deal with a fascist or a little Mafioso boss. Or the fear of having a real movement outside your doorstep. We think we must greet this Sicilian movement with enthusiasm, and wish it a long life and a fast expansion. InfoAut, Palermo crew, January 20 2012, original article here. And you can also follow it on Facebook and Twitter.